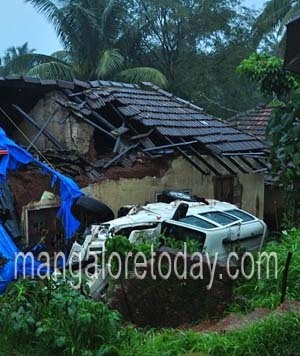 Mangaluru July 16, 2016 : The speeding scorpio rolls over a house near Sankolige in Ullal , National Highway on July 15 , Friday. It is learnt that the driver was on his way back from Mangluru Airport towards Kerala in a Scorpio jeep . The driver lost control on the vehicle and rolled over the house near Sankolige . In the accident the house belonging to Sadashiv gattti was damaged. The driver escape with minor injuries. The rash and negligent driving was the reason for the accident. The case has been registered in Ullal police station. What about the people in the house? The driver was lucky that he escaped unhurt in the accident. Even after seeing so many accident we never learn from it.